Several of the more modern chargers have a "storage level" mode for Lithium cells. The correct storage level is around 3.85V per cell. At ambient, normal room temperature, a cells optimum fully charged voltage is 4.2V. 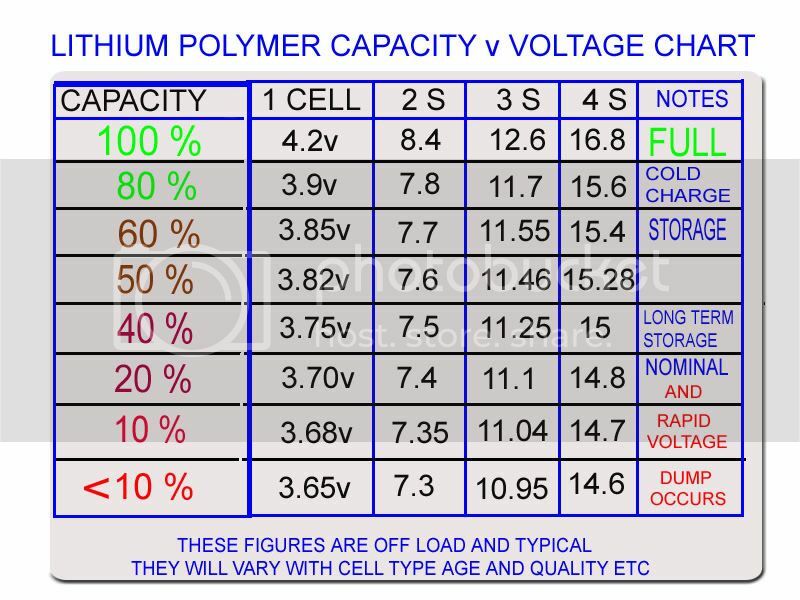 This optimum fully charged voltage value goes down if charged in lower temperatures - If you charge a lithium cell at below 10degC temperature the charge voltage needs to be about 3.9 volts to 4.15 volts not 4.2V. Remember that at 4.15v or so a cell is over 90% charged and will still give excellent performance. If you charge to 4.2V at this low temperature you can damage the cell due to overvoltage - at the very least you will probably reduce its overall lifetime, because when the cell is then taken to a normal temperature it will rise in voltage slightly and therefore become effectively slightly overcharged. If you charge a lithium cell to 4.2V at normal room temp and then put the cell in the fridge and take its temperature down to 10C or less you have effectively overcharged the cell because 4.2 volts at this low temperature is where cell damage is starting. This same effect could be seen by charging at normal temperature, then taking the batteries into a cold outside environment such as a winter flying session. Storage at low temperature - even in a fridge - is a very good way to preserve the overall life of the cells, providing they are only charged to the levels as shown above. Using them cold of course is different - they perform very poorly if cold - very noticeably in EDFS etc, where every little bit helps. I always warm them in the car or my inside pocket before fitting and flying. 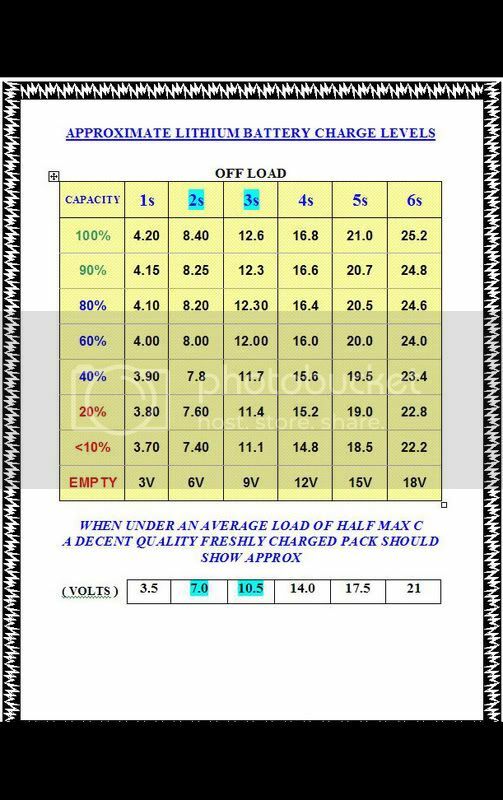 The following chart gives the various charge level parameters for all common cell types. The minimum discharge voltage shown here is for an unloaded cell - in use - under load. LiPos can generally brought down to around 2.8V without damage. Longer overall life can be expected if this is kept higher..... but then there is always a compromise between flight time and battery life! Nice one Timbo! useful to have. Legible in full size. If somebody wants a hard copy ie: me If other members feel the same but do not know how to. Just open microsoft word or compatable program - click on full size Image above - left click to copy - Then paste into your word document expand or crop if required and print. I presume all copyright is waved Timbo! Alan, try Optrex on your sticky eye. I can tell you are from my neck of the woods you old dog! Even iiiif I had'nt read your profiiile Eric!! Wiiill have to check out Rivington flying sites one day. Was up there in the area recently but never made it past the Black Dog at belmont or Rivington Barn! Must admit I do miss the area. The Lincolnshire moutain rescue team dont get alot of work around here! Sorry Timbo - off thread! David A...could I suggest this as another sticky please ? Ok, no prob Tim. Ah good and the little one I hope? The voltages shown for 80% and 90% full 3s packs are identical (12.3v) - do you have a suggested amendment? 15 articles I did say they were approximate....but if you insist, how about 12.35v for 90%? That's close enough for jazz, Timbo..
12.45v for 90% full would be fairly close to a linear relationship, as suggested by most of the other data points. Your chart has now been pasted into my reference book, over the rough pencilled figures you gave some time ago. I make reference to the chart frequently, to access how much capacity was left after flying. One question remains, in your opinion have deep can you sensibly discharge to. I note that you have indicated about 20%. I have gone as far as 3.86, without the BEC coming in. As a point of interest I plotted out the graph (some time ago), and found it is " Directly Proportonal" or "Linear" or of the type Y=mx+c (c=0), I am having such fun . Given the normal accuracy for experimental observations. By the way, My Imax6 works far better than booth my Perkins Lipo 2000 with Overlander cell balancer, far quicker and balances the cells far more accurately. Keep on working Timbo, your reward will come in heaven. I regularly allow my cells to get down to 2.75 under load and have on occasion seen some ESCs set a 2.65 cut-off.....in fact the 80A one I am currently testing on the EDF setup does that. I immediately put the pack onto balance charge, and 2 x cells show below 3V but quickly recover to just over 3V and charge back to 4.2 as normal. Knew you would like the Imax6 - for the money, I reckon it takes some beating.